(Inside Science) -- Aerial bombing during World War II caused destruction and death on a mass scale. Allied air forces dropped 3.4 million tons of non-nuclear explosives on the enemy targets. Some of the bombs, like the 22,000-pound Grand Slam, dropped on Germany by the British Royal Air Force, were so large they required four-engine aircraft to take them to the targets. From Feb. 13-15, 1945, 722 bombers of the RAF and 527 planes from the U.S. Army Air Force dropped so much munitions on the German city of Dresden that it started a firestorm that sucked the air out of air raid shelters. American writer Kurt Vonnegut, then a prisoner of war held in Dresden, reported in his 1969 novel, Slaughterhouse-Five, that it produced “carnage unfathomable.” Up to 135,000 died. 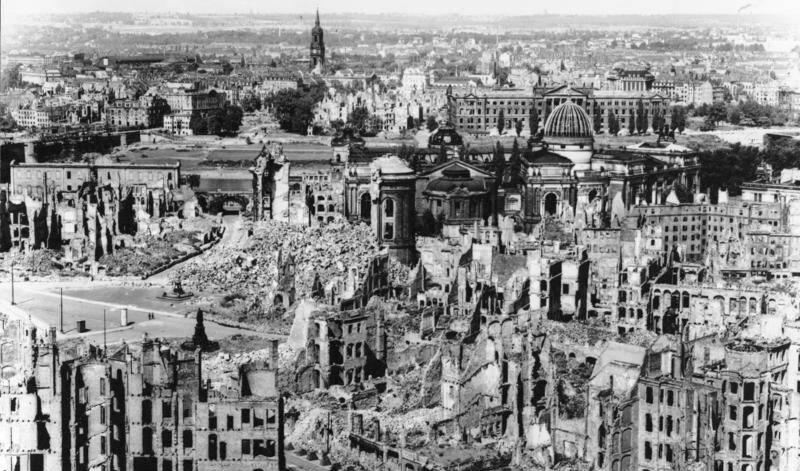 As many as 600,000 Germans may have died in Allied bombing raids. It turns out the destruction on the ground is only part of the story. The shock waves from the bombs in the European attacks throughout the war affected the layer of the Earth’s atmosphere known as the ionosphere, which reaches about 50-1,000 kilometers above the planet's surface during the daytime and is located at the edge of space. The layer, made up of ions and free electrons, affects radio transmissions, GPS satellite transmissions and radar. It’s not known if the changes caused by the shock waves had any effect on the war effort. Recently, modern British scientists looked at the effects of low-level forces like lightning and volcanoes in the upper atmosphere from archival data collected during the war by the Radio Research Center in Slough, in the U.K.
“I wanted to find a source of explosions that did not involve an electrical discharge so that I could separate the effects of the shock waves and the electricity,” said Chris Scott, a meteorologist at the University of Reading in the U.K. The researchers discovered that shock waves from the bomb blasts correlated with the bombing raids that had occurred hundreds of miles from England. Each raid had the effect of at least 300 lightning strikes. The blasts weakened the ionosphere, probably by raising the temperature. They also interfered with radio transmissions, but at the time, no one knew why. The study is published in the current issue of Annales Geophysicae.